Hasn’t 2014 been a weird year for Reading? When it started we were all getting over the shock of Jackson’s closing down, and it’s been another year of greetings and partings. Some of the partings have been surprising to say the least: who’d have thought this time last year that we’d say goodbye to Vicar’s, the iconic butcher on West Street? Who could imagine that the last edition of the Reading Post would appear on newsstands? Who could guess that Reading F.C. would sack another manager? (All right, maybe some of the changes were less surprising than others…). It makes you wonder what 2015 has in store, and what other time-honoured local institutions may be in jeopardy. Will the After Dark still be open this time next year? Will the doughnut kiosk recorded announcement be heard no more? Will Reading Elvis move to Swindon? I can’t imagine anything worse for the town’s morale (or for Reading Elvis – come on, Swindon’s a bit of a hole, right?). There’s also been a steady succession of restaurant closures: this is the year we said goodbye to Kyklos, Al Tarboush, The Lobster Room, The Eldon Arms, Cappuccina Café, Arepas Caffe and one of Reading’s two branches of Bella Italia. A real mixed bag, that, including a few places that I still really miss (no, not Bella Italia) – and an apt illustration that doing good food isn’t enough to guarantee a restaurant’s survival. It needs to have a USP, to get the rest of the basics right and to find a way of making sure that people know it’s there. A really tricky business, in more ways than one, and I can understand why it must seem like a thankless one too. Of course that doesn’t stop new establishments taking their place – sometimes literally – and this year we’ve seen plenty of those: My Kitchen, Casa Roma, Chronicles, Coconut, Rynd, Faith Kitchen and Nibsy’s all opened this year. Just this week Artigiano, an on-trend mixture of coffee shop, lunch spot and wine bar, has opened on Broad Street. We’re due to get CAU early next year and there are perennial rumours that Tamp Culture will eventually give up shivering at their coffee cart and take up a more permanent space in town. The sometimes daunting-looking odds, for now at least, don’t discourage people from having a go. And it’s not all doom and gloom, because there are other signs of a bit of a renaissance in town. The independent retailers – The Tasting House and The Grumpy Goat – that opened late in 2013 seem to be doing rather nicely. Reading now has three supper clubs and the most entrepreneurial, Pop-Up Reading, has done a variety of collaborations, serving its food in cafés and churches. The hyperlocal scene is better than ever, giving Reading folk a much wider range of sources for news, views, reviews and comment – both Alt Reading and rdgnow started this year and do an excellent job – and it will be interesting to see how things change next year with getreading going digital only. There’s even some bloke reviewing roast dinners. Anyway, like last year ER is taking Christmas off. For me, Christmas is a time to eat lots of food, completely uncritically, without being plagued by those on duty thoughts that always seem to happen when I eat in restaurants. Besides, you really wouldn’t want to read an ER review of my Christmas dinner (and by about halfway through I wouldn’t be in a fit state to write it anyway). But I couldn’t leave you empty handed – and what better way to round off 2014 than with this, the inaugural Edible Reading Awards! So sit back, grab a canapé (not a euphemism – at least I hope not) and read on while I open a bunch of tatty-looking gold envelopes and announce my big winners of the year. Is this microphone on? A lot of the places that could have won this award have put themselves out of the running by closing: I think at one point Reading had enough top quality sandwiches on offer that you could probably have started a blog just reviewing them. So sadly the magnificent banh mi at Cappuccina Café and the superb pulled pork burger (it’s just a sandwich, really) at the Eldon Arms miss out here. But even if they were still going, I would still have opted for the delights of Shed’s tuna melt. I know I’ve not reviewed them yet, but that doesn’t mean I haven’t visited on a number of occasions and of all their sandwiches the tuna melt is my runaway favourite. Partly it’s because of the bread – big pillowy ciabatta which you really don’t get anywhere in town. Partly it’s because of all the little extras in there that elevate it above the same thing elsewhere – generous oozy cheese, slivers of red onion, the crunchy sharp surprise of scattered capers. And partly it’s just because it’s a lovely spot to eat, run by lovely people. This was such a difficult category. When looking through the contenders I started to wish that all my favourite restaurants could just join forces and set up the ultimate small plates venue: the wavy lines appeared, like they do in TV dream sequences, and I found myself imagining a single place where you could order the momos from Sapana Home (the only thing there I truly enjoyed), the gorgeous crunchy, hot, spicy Gobi 65 from Chennai Dosa and that earthy, decadent truffle ravioli that nearly – but not quite – made Ruchetta worth the money. In the end, though, the winner was the starter that most took me by surprise: I wasn’t expecting to love a salad of warm grilled chicken and vegetables, served in a hot, sweet, sour, sharp dressing that knocked my socks off. I wasn’t expecting to love a salad full stop, in all honesty, but this tasted like nothing else I’ve eaten this year. People have told me since that they went to Art Of Siam specifically to try it. I can’t say I blame them. I’m not always right about things first time. When I went to Bhel Puri the first time I quite liked it, quite liked some of the things I’d eaten, quite fancied going back some time. I was quite wrong. Over the months since then I find I keep going back there: it’s a wonderful Technicolor alternative to what, even when it’s done well, can feel like quite a monochrome selection of coffee shops in Reading doing some sandwiches or bagels, some salads and the odd quiche. I always have the chilli paneer – because if I don’t my lunches would all be tinged with regret – and from there I’ve gone on to explore the outer reaches of the menu. I think the service there has got better and friendlier over the year, and every time I walk past I’m delighted to see that it looks pretty busy. Also: vegetarian! Just saying. Honourable mentions have to go to another beautiful way to cook lamb, Kyrenia’s incredible kleftiko – but I feel I’ve enthused about that quite enough quite recently. I also adored Dolce Vita’s saltimbocca – made with veal back then and with chicken more recently – tender meat pounded thin, wrapped in salty prosciutto and bathed in a light, delicious sauce rich with wine and sage (and truffled mash, which could turn even a Fray Bentos into a world-beater). And, although they continue to serve it in a soulless glass box with all the atmosphere of the deserted space station in Gravity, La Courbe’s mixed grill – with that unbelievable tabouleh – is still one of the finest main courses in Reading. But the dish I kept dreaming of was Bhoj’s karahi lamb: chunks of lamb, soft to the point of surrender, in the most intense, sticky, savoury sauce. I was back there only a couple of weeks ago, trying it again. I’d like to pretend I was giving it one last check to make sure it was worthy of the accolade, but in truth that decision was made some time ago. I’m almost sad to have to pick a winner here because every restaurant in Reading that does good service ought to be applauded. But my experience of most places in Reading that get service right is that they’re still very much about star players: Matt and Alex at Mya Lacarte are absolutely flawless, but everyone else doesn’t quite reach that standard. Marco at Pepe Sale could teach everyone how to do this, but again the rest of the staff can feel a little more hit and miss. Ihor at Kyrenia is as kind and welcoming a front of house as you could hope for, but he’s just one man. Dolce Vita win this award because they are a proper team – whichever of them is looking after me I know I’ll feel exactly that: looked after. They also judge how to serve tables so well – there’s no one size fits all here, so they are more friendly, more formal, more raucous depending on whether they know you, what your group is like and what kind of night you want to have. That Dolce Vita is such a friendly, fun, buzzy place to eat is very much down to that. I don’t think I’ve had much luck with desserts this year. The hot school dinner style desserts I adore have been thin on the ground and instead I feel I’ve gamely struggled through underwhelming cakes and prissy little parfaits, delicate but underwhelming stuff. Part of the problem is that if I’m full, or I really didn’t rate the first two courses I’m more likely to pass on dessert (and fewer desserts means fewer runners and riders). It wasn’t all disastrous, though. I was very impressed by the pot au chocolat at the Three Tuns – that chilli and cardamom in there elevated it to something quite magnificent – but it still felt like it wasn’t special enough to win. I also loved the honey and rose kulfi at Chennai Dosa (a place which nearly won a few of these awards) for its fragrant yet refreshing cleverness. Instead, I’m giving this award to Tutti Frutti for very good reason: when I’m eating on duty in town, and I don’t much fancy a dessert, I’ve come to realise that the test I use in my head when I read that little menu in front of me is this one: is anything I order going to be half as good as Tutti Frutti’s peach and amaretto ice cream? Will it be able to match that smooth creaminess, that hint of fruit, those soft soaked amaretti biscuits with that slightly boozy sweetness? If I know for a fact that the answer will be no, I just get the bill instead. And half the time, if I’m reviewing somewhere in town, because that idea’s in my head I wander across to the station and visit Tutti Frutti instead. It’s a wonderful, quiet, Edward Hopper-esque place late at night – just me, my thoughts, a few workers from the station in their reflective jackets, and that glorious ice cream. Try it sometime, if you get the chance. I am not a massive coffee fan. If you talk about washed Ethiopian whatnots or the size of your roaster I glaze over very quickly. I think it’s great that Reading has so many coffee places, but I still long for some fantastic tea rooms, and places that know the value of a gorgeous smoky lapsang souchong or a floral, elegant Earl Grey. That said, I love reading Tamp’s updates in my feed – even if I don’t understand all of them. You get a real picture of life outside the Oracle at their little cart – what they sell, what they do, how they work – and it comes across that they really love what they sell, what they do and how they work. The boys at Tamp both remind me a little of Shaggy from Scooby-Doo. They’re what Shaggy would be like if he was less interested in constructing sandwiches the size of Thames Tower and more interested in crema (whatever that is). A lot of restaurants just do not get Twitter at all – to see it used regularly with such infectious enthusiasm is an absolute joy. I should also mention that I particularly enjoyed Tamp’s massive spat with Workhouse Coffee earlier this year – it was Aeropresses at dawn as they bitched about one another the way only coffee geeks can (“your roaster is too small” “well you bought cakes from Costco and frosted them yourself” etc.). It made me chuckle in the middle of a particularly hectic shopping trip to Regents Street. An honourable mention has to go to the lovely people at Pop-Up Reading. Stop making me hungry, you two. When I went to Dolce Vita the first time, I thought the service was great, I really enjoyed the food and I thought their menu was too big. They got a good mark from me, but I suspected in the back of my mind that they’d been fortunate and that if I’d picked different dishes they might have been found out. Well, that shows what I know. Dolce Vita wins this award because I keep going back and they keep not being found out: I really don’t know how they do it. They also win this award because the range of cooking I’ve had there over this year has been quite something. They do pizza, they do pasta, they do very creditable meat and fish dishes. But they also have a regularly changing set menu which – without any fanfare or showing off – is a darned sight more reliable than London Street Brasserie’s just down the way. So I’ve had big rib-sticking comfort dishes – open ravioli packed with rich game, proper lasagne with beef and pork and chicken livers. But I’ve also had much more restrained, yet equally accomplished stuff – cod cheeks with lentils and a beautiful, fresh salsa verde was a stylish, subtle delight. (They also cook squid beautifully, without a hint of batter or breadcrumbs or mayonnaise in sight). In many ways I think Dolce Vita is the town centre restaurant I’ve spent a long time looking for, and if I want to eat in town but can’t decide where it often gets the nod. I’ve had quick suppers here and long, drawn out dinners, conspiratorial lunches with friends and big loud celebrations with lots of people. The service is brilliant and they even have a bottle of Averna behind the bar for when you want the evening to last just that little bit longer. Of course, it’s not perfect – no restaurant is – but that’s probably for the best, because if I found the perfect restaurant I wouldn’t write a blog anymore and if you did you’d stop reading mine. But for 2014, it’s as close as I’ve got. Here’s to continuing that search in 2015 – and until then, have a lovely Christmas and a Happy New Year! Bit of a weird one, this: Kyrenia changed its name in January 2016 to Ketty’s Taste Of Cyprus as it was under new ownership. The new management has changed the menu and the previous service, a big part of Kyrenia’s offering, has now left the business. As a result I’m marking this restaurant as closed and I may go back and review Ketty’s Taste Of Cyprus in due course. I’m sorry, but I’ve got a confession to make. I’m burned out. Running on empty. This whole business of going to a restaurant every week takes its toll, you know (I’m not expecting sympathy, don’t worry). And it’s the end of the year – Christmas party season is fast approaching and I’ve got very little left in the tank. So this week, rather than go somewhere that would be a voyage of discovery for all of us, I went somewhere I know well: I’ve been going to Kyrenia, Caversham’s Greek Cypriot restaurant, for as long as I can remember. I love it – and I’m going to spend this review telling you why, because when I visited it on duty it was as terrific as always. Besides, it’s been a bit of a bad run recently, hasn’t it? So think of this week’s review as a present to me (because I bet you haven’t got me anything, not even a box of Toffifee). Kyrenia’s dining room hasn’t really changed in all the time I’ve been going, because it doesn’t need to. It’s perfect, simple but smart – no exposed brickwork and bare bulbs here – with clean white tablecloths, crisp cloth napkins and comfortable unfussy chairs. There are black and white photos on the walls and not much else. The greeting is warm and friendly and Ihor, who runs the front of house, is charm personified (in an endearingly apologetic way, truth be told). Kyrenia has a number of different menu options – they do a la carte, it’s two for one on Tuesdays, there’s a smaller set menu some of the week, but the thing to do here is order the meze, especially if it’s your first visit. I can’t stress this strongly enough: for twenty four pounds a head you get an incredible array of courses and variety (that’s your first tip, right there). The first thing to arrive were the cold meze, a range of familiar friends and a very easy way to be led astray. Houmous was rich and smoky with a touch of garlic, a world away from the contents of a plastic supermarket tub. Taramasalata – something I avoid anywhere else because it’s often too oily and fishy – was light and delicate. Tzatziki was zingy and fresh, just the right side of tart, the flavour softened with cucumber. All of these came with a basket of warm, griddled, slightly charred pitta bread. That alone would be a feast, that alone would be enough but the other cold dishes were equally delicious. Beetroot, apple and walnut salad was fragrant and sweet rather than sharp and astringent, and potato salad was light and simple, just potato, good oil and parsley. If I’m being critical (and it’s hard, where Kyrenia’s concerned) the tabouleh wasn’t as vibrant – in colour or flavour – as I’ve had elsewhere, and the olives felt like a space filler, but they were minor issues. This was a wonderful range of dishes, and the nature of it means it works equally well if you’re dining a deux or part of a much bigger group (here’s your second tip: I’ve been in those groups and watched people make the classic mistake – overdoing it on pitta bread and filling up ahead of the other courses. Don’t do this, because the best is yet to come). The hot meze only came out when the staff had checked that we were ready – a lovely touch, I thought – and when they did, as always, it became time to reassess how hungry I really was. 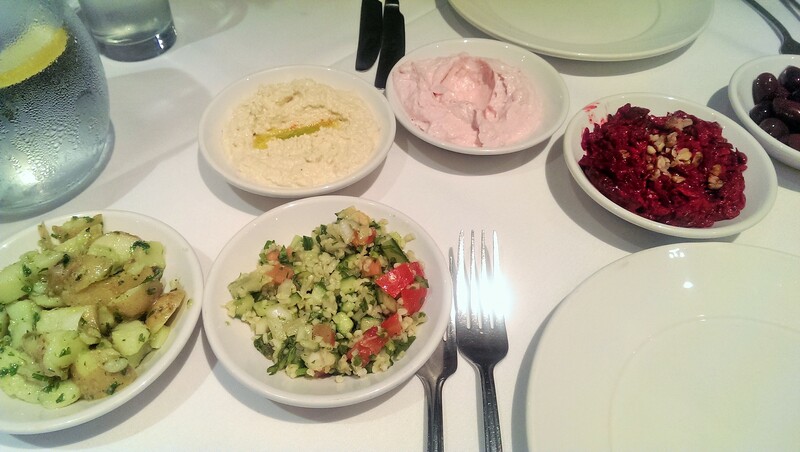 Meze is about playing the long game, but the problem was that again, everything was too delicious to leave. Some of the classics – halloumi and calamari – were present and correct. The halloumi was unsurprising (halloumi in restaurants is pretty much always the same, everywhere) but still gorgeous, but the calamari was spot on – no hint of rubber, just light batter and fresh squid. They’re classics for a reason, after all. Most of the other dishes were every bit as good. Lamb meatballs were possibly the pick of the bunch – juicy, coarse and savoury, studded with herbs and onions and a touch of garlic. Loukanika (Greek sausage) was Peperami’s glamorous continental cousin, warm with cinnamon, almost perfumed rather than one-dimensionally spicy. Dolmades had more of that delicious minced lamb folded into them, though there was probably too much leaf and not enough stuffing. The beans in tomato sauce were the only real disappointment – big, bland and filling, they were soon abandoned. Those six dishes may only merit a sentence or so each, but add that to the seven that came before and it starts to become clear: this is a marathon, not a sprint. Of course, I knew from personal experience to keep something in reserve for what came next: although again, only when the staff knew I was ready. The souvlaki – grilled skewers of pork and beef – were pleasant enough (possibly a tad on the dry side), but they weren’t the main attraction here because that was indisputably the kleftiko. I’ve had this dish countless times in Greece on holiday trying to find anyone who can match Kyrenia’s version, and I’ve given up now because what Kyrenia does to lamb is a work of utter genius: the almost godlike kitchen knows how to slow cook it until mere mortals like me struggle to describe how good it is. It came on a large piece of bone but the merest whisper of effort soon sorted that out, leaving me with an awful lot of the most tender lamb I’ll probably ever eat. It broke into moist, sticky shreds, almost like confit, perfect for smooshing into the juices on the bottom of the plate before eating in nodding, smiling, euphoric silence. 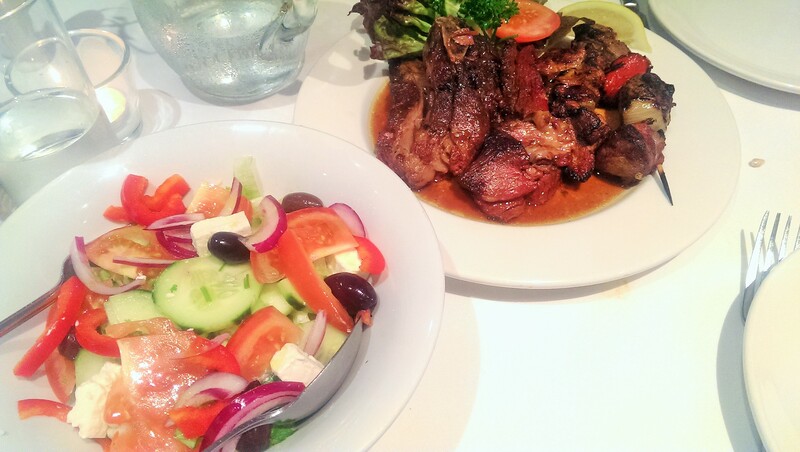 Again, because I feel I ought to be critical, the Greek salad it came with was a little underwhelming – but it’s only salad, isn’t it, and a cubes of feta is the perfect partner for a piece of lamb (that’s your third tip, if you’re counting). I also know from personal experience that if you’ve made the rookie mistake of filling up on pitta and tzatziki, Ihor will bag up all your leftover meat in a little foil parcel for you to take home and enjoy the next day. I also know from personal experience that it’s almost as good cold the next day, but take it from me if you go: pace yourself and eat it on the night. One of the only other disappointing things about Kyrenia is the wine list. Greek wine can be absolutely fantastic, and is much underrated, but Kyrenia only sells a handful of bottles. None the less, the ones they do are lovely – we had a bottle of Naoussa Grande Reserve which was nicely balanced against both the meat and fish in the meal, far too easy to drink on a school night and not at all unreasonable at £23.50. The last course at Kyrenia, the fruit salad, is really just a palate cleanser. I would be astonished if anyone could eat a “proper” dessert after all those meze so it seems apt that the meal ends with a plate of orange, melon, grapes and strawberry. It worked, though: fresh, bright, sweet and healthy (like Miley Cyrus before it all went so horribly wrong). It didn’t redeem the sins of all that lamb but it helped me fool myself, and very few desserts achieve that. I’ve mentioned Ihor a few times, but service in general was perfect. All of the staff are so good at what they do, getting all the little touches right. Asking if you’re ready for the next set of courses, finding time to chat, knowing when to offer you extra pitta (although if you’ve read this far, you’ll know to turn that offer down – trust me on this). Again, to be critical I’d say that you should ask to be seated downstairs: sitting upstairs, in a smaller less buzzy room, far from the bar and the kitchen you can sometimes feel a little overlooked. That’s your fourth and final tip – ask for a table downstairs when you book, because they get busy at weekends. Dinner for two – all those dishes and a bottle of wine – came to £71 excluding service. It’s probably the best £71 meal I’ve had all year. I recommend Kyrenia all the time – to friends and on Twitter – and it was getting to the point where not having reviewed it was looking like a glaring oversight. I went on duty hoping that they had a good night, but I really needn’t have worried because I’m not sure they know how to be anything but brilliant. 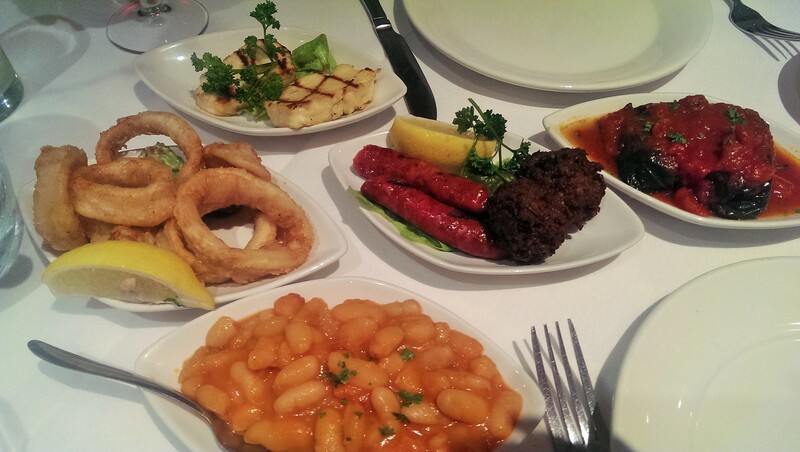 There’s loads of stuff on the a la carte that I haven’t tried (I’d love to have a go at their stifado, or their monkfish souvlaki) and I know for a fact that their octopus is out of this world, but all of the best evenings I’ve had here have all involved the meze. Unlike most restaurants in Reading, Kyrenia feels like it’s perfect for everything – small intimate evenings, big raucous evenings and everything in between. It’s only a matter of time before I go back – in fact, on the way out I looked in the front door, still shining with that cosy welcoming light, and saw that they’re offering their standard menu on New Year’s Eve. See you there? I’ll be wearing the white carnation and the gold party hat and drinking the Greek red. Yamas (and Merry Christmas!). Apologies to any vegetarians reading this, but there are few things in life more joyous than crispy duck pancakes. There’s something about that combination of flavours and textures – crunchy cucumber, soft duck, the particularly prized crispy bits, all salt and skin and the intense, sweet yet savoury hoi sin – all almost visible through the paper thin translucent pancake, rolled up as tightly as your greed will allow and crammed into a hungry mouth. And yet Chinese has to be one of the most under-represented cuisines in Reading. We have Indian restaurants all over the place, we have Italians coming out of our ears, as it were, but where can you go in this little town to overfill on prawn crackers, starters and crispy duck only to be defeated by the main courses? Nowhere, as far as I can tell. China Palace doesn’t fit the bill, for me at least: possibly because it’s too authentically Chinese and possibly because it’s just not that good. Furama (I have friends who still call it Futurama, which gets annoying after a while) has never impressed me. Reading’s best Chinese restaurant, Chi, closed ages ago after trying three different venues in town. I still miss Wayne Wong’s charming if haphazard service and his delicious food – prawns coated in light, brittle batter with a sticky, sweet chilli sauce, pristine cod smothered in garlic-laden black bean sauce… (I could go on, but I might cry). So out into Lower Earley, then, where the mini-precinct at Maiden Place has had something of a makeover. Instead of an off licence called simply “Bargain Booze” there is a spanking new WHSmith and some other shops have morphed into a shiny Sainsbury’s Local. On the edge of the precinct sits Kei’s, a restaurant I tried to review once before but left after I was offered a woefully dark and forgotten corner table, despite booking. I’ve got over this now: six months seems long enough to hold that particular grudge. Besides, people do say it’s the best Chinese restaurant in Reading. Entering a buzzy restaurant on a cold and drizzly midweek night always lifts the spirits, and stepping into Kei’s was no different. The dining room is quite cleverly laid out with the smaller tables grouped together and the bigger, potentially louder, tables at a slight distance. It was so busy that I didn’t even mind waiting for a suitable table to become free (sitting on the squishy three piece suite in reception felt a bit like being back in 1979: I rather liked it). The waiter offered the a la carte or the “eat as much as you like” (which they do Monday to Thursday). At first I picked the former, feeling a little snooty about the latter, but a quick inspection of the all you can eat menu revealed that it had pretty much all of the dishes I’d been salivating over on the website. Plus – and this was the crucial factor – the food is cooked to order rather than sitting on a buffet; Cosmo this ain’t. The first dilemma was how many starters to order: I didn’t want to take “eat as much as you like” as a personal challenge, but on the other hand I wanted to try as much as possible. How many would you have picked, between two? Well, if you answered “four” you win a gold star. Of them, the dry spare ribs were the first to go; imagine your favourite spare ribs with nicely spiced meat falling easily off the bone but none of that sticky sauce that winds up all over your fingers and face and you’ll have a pretty good idea what these were like. The salt and pepper five spiced squid was less successful. The squid was nice enough – thin strips, tender rather than bouncy – but they were underseasoned and bland, with nowhere near enough salt and more sugary sweetness than five spice. The Thai style smoked chicken (the menu at Kei’s seems quite happy to wander from China to Thailand and even onwards to Vietnam – it’s almost as if it’s on a gap year) was rather similar to the squid, just a little darker and much sweeter. There was no discernible smoky taste but there was some nicely mashed garlic and spring onion at the bottom of the heap that balanced the sweetness a little. And finally, one of my favourites, the crispy fried seaweed. I know it’s not seaweed and I bet it has more fat than I’d want to know about but I love the crispy, salty, sweet taste of it and I wasn’t disappointed. I know it’s a staple but I loved it. Only after the plate was taken away did I realise how little variety there was in the starters – largely sweet, crunchy, fried things. Probably not the cleverest idea, but I was starving and I’m afraid I must have been subliminally influenced by the smells wafting from the kitchen; sometimes you order with your belly rather than your head. Can you guess what came next? Oh yes, the crispy duck. I was surprised this was on the “eat as much as you like menu” but when it turned up I saw how they managed this: perhaps it’s churlish to complain but the duck was a little on the skimpy side, especially compared to the big bamboo steamer of pancakes (I think we counted 12). 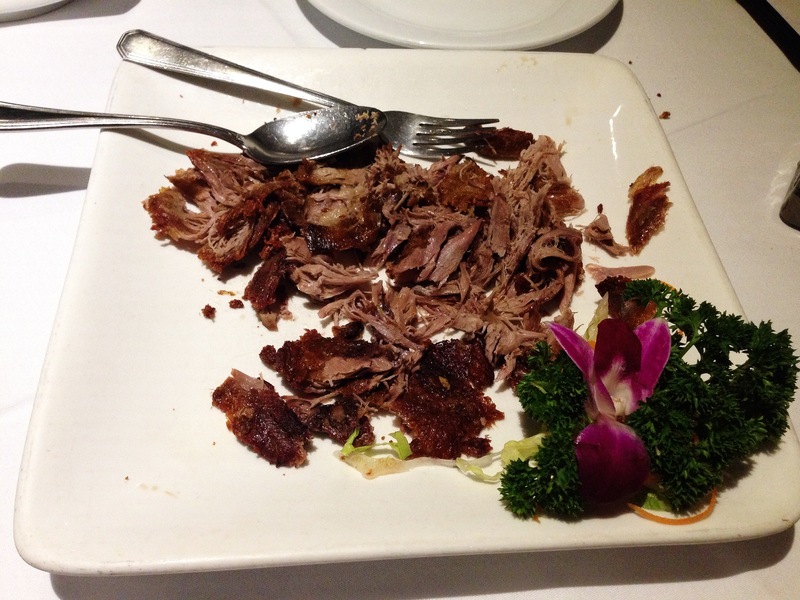 Have you ever ordered crispy duck and run out of duck before you ran out of pancakes? No, me neither, so Kei’s was very much a first in that respect. What there was, though, was as good as ever – it’s a measure of how good this dish is that it’s impossible to eat it in silence (maybe it was just as well that it didn’t last that long). Having eaten all that, how many main courses would you have ordered between two? This time, gold stars for those of you who guessed “three”. I was concerned that this would be a greedy mistake but actually, all of them felt like scaled down versions of what you’d have got if you ordered from the a la carte. 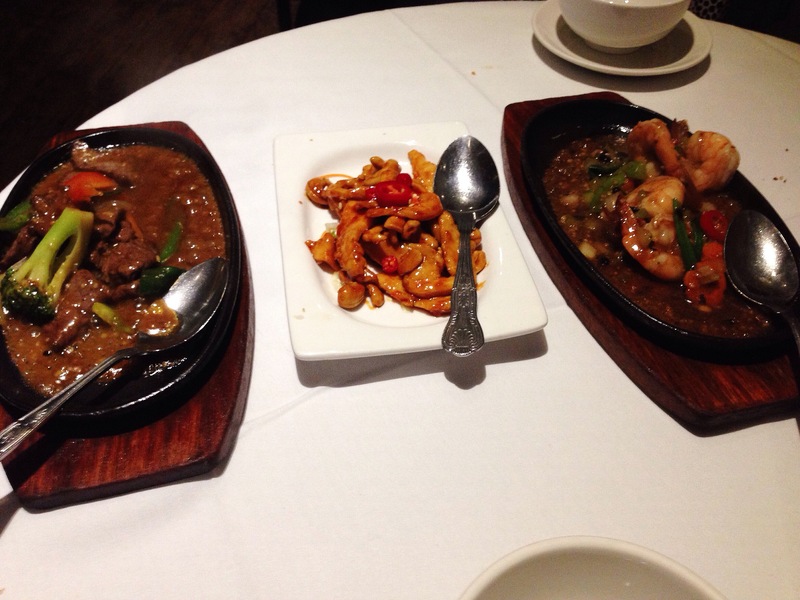 Sizzling king prawns in black bean sauce, for instance, were tasty – but you got four prawns. Serving this on a sizzling cast iron platter seemed strange when in reality the dish could probably have fitted in a ramekin. I enjoyed it, but the sauce was a bit thin on the ground (as were the black beans: I didn’t count many). Lamb in satay sauce, another sizzling platter, was a bit more generous. The sauce itself was smooth and shiny, with a texture a bit like egg yolk and not particularly peanutty. Ironically, given how shiny it was, it was distinctly lacklustre – and when it started to cool the gelatinous nature made it slightly gloopy, stringy and reminiscent of things I’d rather not describe. That said, the lamb was lovely and tender – I just wished I’d had it in “Vietnamese plum sauce” (whatever that is) instead. Oh, and if you’re looking at the picture below: yes, it’s a solitary giant piece of tenderstem broccoli, yes it’s as random as it looks and no, I have no idea what it’s doing there either. The third main, chicken and cashew nuts in yellow bean sauce, had the best flavour and texture but went cold incredibly quickly. I didn’t check the dish when it arrived but I wonder if it was served in a chilled bowl. Maybe I should have tried it before the two sizzling dishes, but either way it shouldn’t have got this cold this quickly. Again, the sauce was tasty but – as with the other two dishes – you didn’t get enough of it to make the rice interesting (the plain steamed rice, also a bit claggy and lukewarm in next to no time, needed all the help it could get). We had a couple of diet cokes and a colossal 250ml glass of sauvignon blanc, the only white they offer by the glass and the only size glass they serve it in. Often, house wine tastes like it’s punching slightly above its weight – this one tasted very much like a house wine, and 175ml would have been plenty (hark at me, it’s not as if I let any go to waste). Service throughout was pleasant and attentive: staff were friendly, efficient and patient when it took us some time to pick our food. 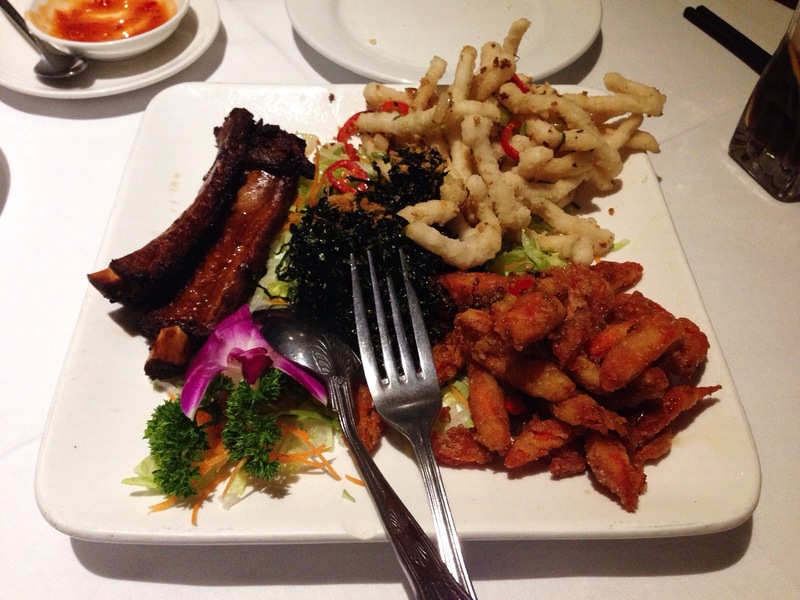 Having said that all the dishes were on the small side, it’s only fair to say that the quantities I’d ordered worked out well – we were both nicely full without being stuffed which often isn’t the case in a Chinese restaurant. Just as well, though, as I wouldn’t have felt like I’d have been able to go back and ask for more dishes if I’d under-ordered. The all you can eat option is just under twenty pounds per head and our total bill, including a semi-optional service charge of 10%, came to fifty three pounds. Is Kei’s Reading’s best Chinese restaurant? Yes, it probably is (unless Happy Diner in Caversham turns out to be stellar) but that didn’t make me feel like hopping on a bus to Lower Earley any time soon to pay it a return visit. Instead, it made me wish that Reading had something better that could compete with the delights of Chinatown, or even some of the offerings just down the train tracks in Oxford. If Kei’s was on my doorstep, or if I had a friend visiting who really, really fancied Chinese food then I’d go – it’s a solid, reliable restaurant and those are qualities a lot of people value. But most of all, it made me miss the charismatic chaos of Chi: if you never sat at a table in Chi while someone in a rhinestone jumpsuit who doesn’t look or sound remotely like Elvis serenades you with “Devil In Disguise” you haven’t lived, take it from me. Maybe we’ll see its like again at some point: until then, Kei’s might have to do.